Browse: Home / Check_ioc is a script to check for various, selectable indicators of compromise on Windows systems. 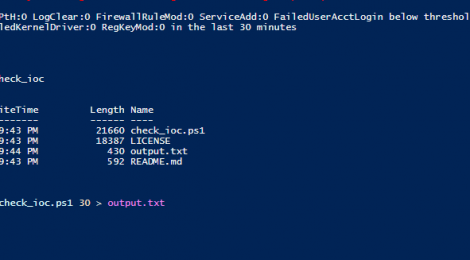 Check_ioc is a script to check for various, selectable indicators of compromise on Windows systems via PowerShell and Event Logs. It was primarily written to be run on a schedule from a monitoring engine such as Nagios, however, it may also be run from a command-line (for incident response). ← mmLoader is a stable library for loading PE module bypassing windows PE loader.